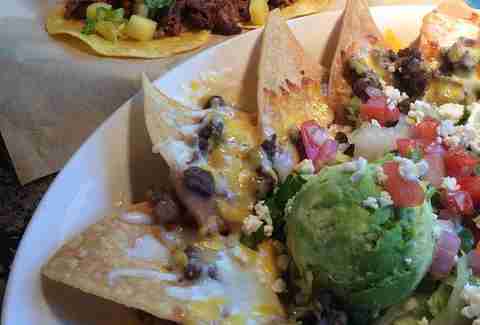 When it comes to nachos, everyone has a preference. Some prefer the stale chips coated in chemically glowing orange goop topped with jalapeños that they sell at sports stadiums, others like their nachos to have the ingredients individually stacked on each chip (aka the people who eat pizza with a fork), and there are even a select few who prefer that movie where Jack Black wears tight clothing. But if you’re anything like me, you love a massive mound of tortilla chips buried under meat, beans, and enough cheese to make you feel like you don't need to eat for another month. When you're looking to get seriously deep into a inadvisably large helping of nachos, here's where you need to be going. This Round Rock establishment is taking Tex-Mex to a higher level. 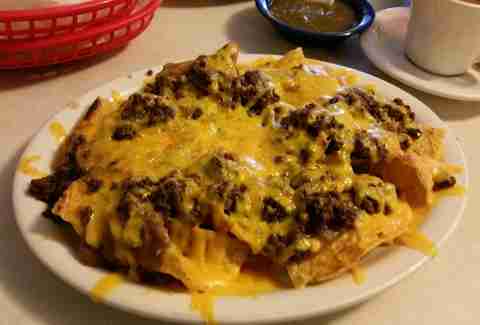 You won’t find everything dripping with grease and coated in cheese -- with the exception of their nachos, that is, which is why they're amazing. 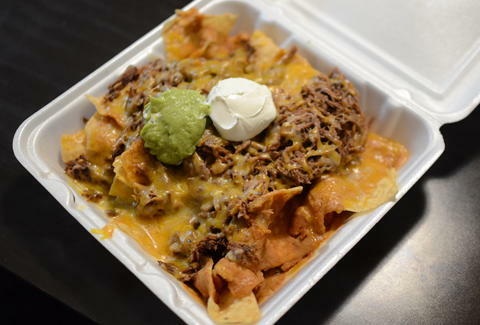 The nachos come spilling out of a bowl and there are some outstanding choices of meat to put on top, from brisket to chicken tinga to pork belly. While Texas Chili Parlor specializes in chili, it also makes some pretty great Tex-Mex dishes as well. If you’ve have had the chili, you can probably imagine the greatness that can come from the nachos. The chips are coated in spicy queso and chili is ladled on top with some jalapeños to give it an extra kick. I suggest being a glutton and getting a bowl of chili to go. This little joint has it all. Cheap tacos, an array of queso fundidos, and of course, those nachos. Pick out the meat of your choice and let El Taquito do the rest. All of the chips are evenly coated in beans, meat, and cheese -- then it's on you to finish them off properly via the incredibly fresh salsa bar. If you’re hanging out in the dive bars along East 6th St, there is a good chance you can smell the alluring smoke from Bomb Taco calling your like a siren. This little food truck parked on the patio of the White Horse grills up some fine tacos, but the nachos are the real bomb -- a massive portion that will keep your stomach ready for a night of pounding cheap beers and bad whiskey. The chips are hidden from plain sight because they are under the mount of meat, black beans, pico de gallo, and jalapeños. Pro tip: skip the lettuce. 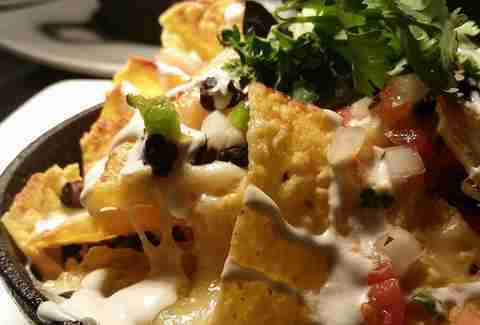 These are nachos, not a taco salad. This family-run restaurant has been an East Side staple for years. The prices are cheap, the service is better than anyone could reasonably expect given said prices, and the same goes for the steadfastly delicious food. The nachos are a work of cheesy art. A massive plate comes piles with tortilla chips which are covered in heavy amounts of picadillo, beans and of course plenty of jalapenos. Give it an extra kick by dousing it in their salsa. Now if we could only get them to stay open past 3pm. Julio’s has been serving standout Tex-Mex since 1983, and is still going strong with a menu stacked with filling, tasty options that come in at less than a Hamilton. Your options are limited to beef, chicken, or vegetarian (sigh, if you must), but it’s all you need. The nachos are kept pretty basic, but the careful attention to flavors and textures will make you see what makes them so special. This drive-thru spot in East Austin is the perfect kind of place for all of the California transplants living in Austin. It makes huge California burritos stuffed with French fries (they're strange on the coast), but you'd be doing yourself a disservice to miss out on the nachos, thoroughly layered with the requisite ingredients (as per usual, the protein choice is your call) and skimping on nothing. You could probably fill up on a half-order, but half-orders are for quitters. "A BBQ restaurant? That’s not Mexican," you say incredulously. Well, if we're being technical, neither are nachos, so calm down. Slab is taking nachos to the next level. There are no fajitas topping this bad boy; we're in Texas, and the most fitting meat of choice would be BBQ. Chips are topped with the smoked meat of your choice along with queso and more. Head there on Monday nights when the nachos are $2 off. This eatery started out as a food truck but has found a home at Lavaca St Bar in Downtown. It makes some of the best po’ boys out of the freshest seafood you will find in Austin. Now, these nachos are going to hurt the wallet a little, but how can you resist with options like blacked crawfish, shrimp, or ribeye? Luckily, beers at Lavaca St are cheap. Sure, it's a chain, but Z’Tejas reliably makes stiff drinks and satisfying food, so the more the merrier! 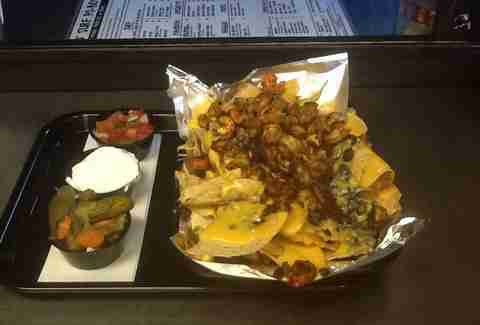 The green chili nachos are what keep me coming back. 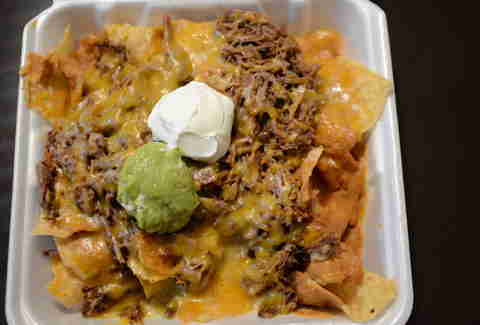 The chips are concealed below the borracho beans, shredded pork, salsa, and cheese. It is the perfect snack while enjoying a margarita or two.